= Echinocereus dasyacanthus var. ctenoides (Engelm.) Backeb. Cactaceae (Backeberg) 4: 2021. 1960 Backeb. Accepted Scientific Name: Echinocereus dasyacanthus Engelm. Mem. Tour N. Mexico [Wislizenus] 100. 1848 Wisliz., Wisliz., Wisliz. SB 1536 (Collector Steven Brack) West of Muzquiz, Coahuila, Mexico. Origin and Habitat: Southern Texas (Eagle Pass to Pecos River), south to Santa Rosa, Coahuila, Mexico, westward into Chihuahua. Habitat and ecology: Apparently now extinct in Texas. Echinocereus dasyacanthus var. ctenoides (Engelm.) Backeb. Echinocereus ctenoides (Engelm.) Rümpler in C.F.Först. Cereus deflexispinus Monv. ex Labour. Cereus dasyacanthus var. neomexicanus J.M.Coult. 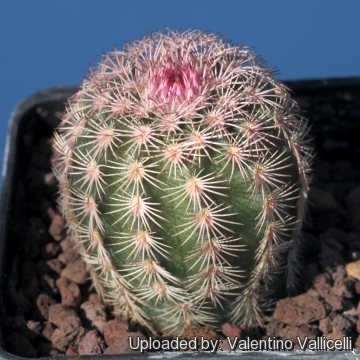 Description: Echinocereus dasyacanthus var. ctenoides is a cylindrical Echinocereus species very closely related to Echinocereus dasyacanthus and may not be specifically distinct. It differs somewhat in its spines and has a more southern range. 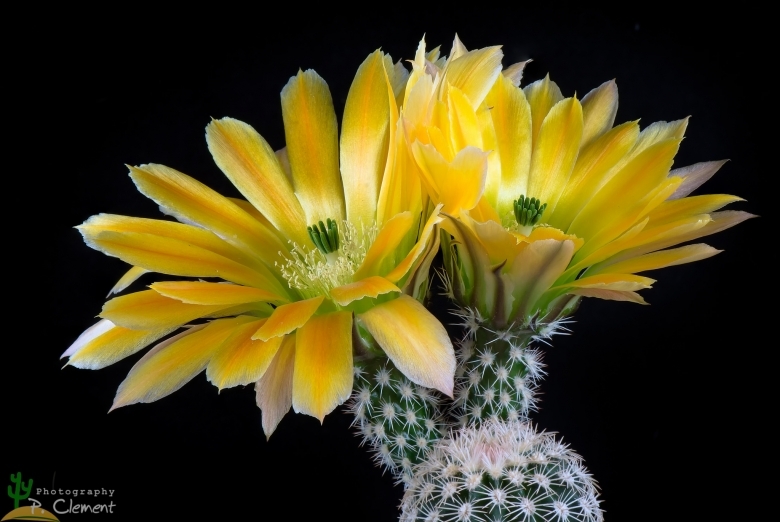 The stems are banded with pink and grey as in the rainbow cactus (Echinocereus rigidissimus). The flowers are yellow, orange, or a blend of yellow and orange and very large for the size of the plant. Stem: Simple or clustering to 6 stems, each heavily cylindric, elongated, 10-15(-40) cm long, to 8 (-10) cm in diameter. Ribs: 15 to 17, low prominently interrupted by tubercles. Radial spines: 14-22, not spreading but standing out at an angle to the ribs. Central spines: 2-4 (sometime as many as to 10), arranged in a single row or sometimes a little irregular, white with very light brown tips, never purplish or banded. Flowers: Large, showy, mostly, orange-yellow, but also yellow or pink, up to 10 cm long, about as wide as long when fully expanded. Perianth segments linear to narrowly spatulate, ends erose, bright to reddish yellow upper part with bright orange midline, lower third green, center bright green. Filaments yellow. Style white to greenish-white. Stigma lobes 13 dark green. Ovary and fruit very spiny with some short white wool. Spines 14 -16 short, rigid, white with dark brown tips. Fruits: 12-30 mm in diameter, spherical or egg-shaped, green then greenish-brown when ripe, covered with short wool, rigid spines, deciduous when fruit ripens. var. wenigeri is considered by Frank (1997) to be a synonym of this species. Echinocereus dasyacanthus var. ctenoides (Engelm.) Backeb. : has yellow, orange, or a blend of yellow and orange flowers to 10 cm scross. Flowerless plant resemble E. pectinatus. Distribution: Southern Texas and Coahuila, Mexico. Echinocereus dasyacanthus var. rectispinus Trocha & Fethke: has slightly longer brown or purplish-black central spines. There are no other clear distinguishing features, and it be regarded as the same species. Distribution: Chihuahua, Mexico.